When Tiffani first started her sales career back in the late 1990s, sales still controlled much of the buyer’s journey. Reps would provide product demonstrations, sharing pricing, and arranging customer references. Last week, Mike convinced you to push through your anxieties to find the CRM that works for you. Now you have this perfectly tailored CRM that fits the way you do business. It’s saving you all kinds of time and money and offering fresh new business insights. You use it to track marketing, sales and service. That’s what CRMs do, right? Whether or not they realize it, every business engages in customer relationship management (CRM). They develop and exercise processes and strategies to grow and maintain their customer base, with activities encompassing the entire customer lifecycle, from lead to loyalty. It’s not news that the world of technology is changing. 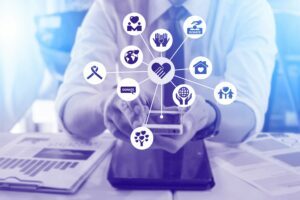 Anyone who operates in our society today is very aware of how technology continues to evolve and become increasingly integral to our lifestyle, professions, and even our health. The article below walks through some situations that you may be familiar with and highlights how modern Customer Relationship Management systems (CRMs) are able to enhance typical business operations. The following article was penned by our Director of Consulting, Dustin Sitton. It provides a more technical view of how advancements in CRM offerings are changing the way consultants and developers operate. Developers Have Been Waiting for This…Or Have They? Technology enables change, and change drives success. We measure success in terms of change: increases, decreases, percentages, growth and trends. But how do we define change? Transformation? Innovation? Conversion? Shift? Transition?